The two world number ones were scheduled to get married. One was the top-ranked female tennis player. She held that spot for 67 weeks. The other was No. 1 in golf. Imagine a tennis-golf wife-and-husband partnership for life, two of the best at their respective games, living a made-for-Hollywood romance? The couple: Caroline Wozniacki and Rory McIlroy. The wedding: this Nov. 8 at the Rockefeller Centre. Sadly, the wedding is not pushing through. Happily, Rory McIlroy is winning — thanks to the breakup. As photographers snapped pictures, on her finger glittered a huge diamond ring. But while the romance of the soon-to-be Mr. and Mrs. McIlroy was on high, their respective games turned southward. Wozniacki tumbled out of the Top 10 and had still not won a Grand Slam singles title. McIlroy? The “Boy Wonder” had fallen to 10th in the world. Love life, excellent. Sports life, poor. Last May, wedding invitations were sent to the elite crowd. That’s when fireworks erupted. Rory, in a heartless way, phoned his fiancee and, in all of three minutes, told her the wedding was off. Caro thought the call was a joke. He wasn’t kidding. Ouch. That was 10 weeks ago. What happened next were some of the most incredible moments in golf. Hours after announcing the split, McIlroy joined the BMW PGA Championship. He won that title in May. In July, he participated in the Open Championship. Having led the entire way, he beats Sergio Garcia and Rickie Fowler by two strokes to capture his third career major trophy. Then, a couple of weeks back, he wins again — the WGC-Bridgestone Invitational. From 10th-ranked a few months ago, he deletes the “0” and vaults to No. 1. And, yesterday, you know what happened. Every Filipino golfer who has cable TV watched the live drama that unfolded early yesterday until about 8:45 a.m. I did. Arising before 6, I quickly googled “PGA winner” only to be surprised that McIlroy, the leader heading into Sunday, was down by two strokes. They were in the 9th hole. I sprung up from bed. Perfectly-timed, minutes later I watched McIlroy sink that eagle putt on the 10th to tie him with Fowler and Phil Mickelson. He would birdie twice more as his two adversaries succumbed to bogeys. What a final last few holes in the year’s final major. A 331-yard drive by the Irishman on the 16th. Phil nearly holes an eagle on the 72nd hole. And Rory could have stayed conservative in the 18th but he still smothers that ball with his driver — resulting in his ball landing just a few feet from the water. He saves par as nightfall descends. Four victories in as many months. The No.1 ranking. Two straight majors. 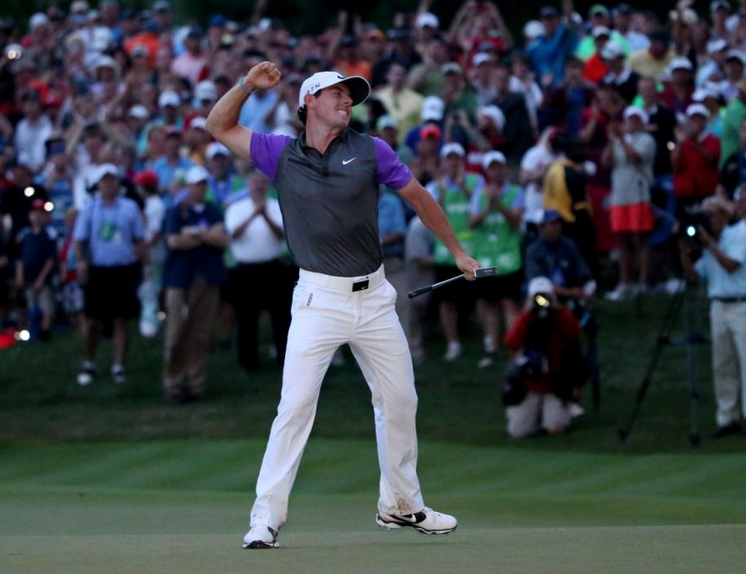 Rory credits one move for this resurgence: the breakup. In tennis, love means nothing. Rory agrees.